Members and supporters of the Independent Drivers Guild protest against Lyft’s minimum wage for drivers at a hearing outside of the New York state Supreme Court on March 18, 2019. 1 Apr 2019 – Gig-economy companies Lyft, Uber, and Postmates are racing to file IPOs this year, a mad dash replete with ever-increasing multibillion-dollar valuations. But is the rush to start trading on the public markets also a sprint to evade compliance with current labor law? Recent financial and lobbyist filings suggest that the gig-economy giants are hoping to get ahead of a wave of enforcement actions, new legislation, regulatory requirements, and lawsuits that could force these companies to finally and formally classify full-time workers as employees. Virtually every major gig-economy company — whether its focus is ride-sharing or grocery delivery — has fought to treat on-demand workers as independent contractors regardless of the amount of time they work. The independent contractor classification generally prevents on-demand workers from engaging in collective bargaining and unionization, and it allows the gig-economy industry to avoid paying health-care benefits and unemployment, complying with standard workplace rules guarding against harassment, or ensuring mandatory breaks. Despite promises of high pay with flexible hours, ride-share workers have found that they often earn less than $10 an hour after vehicle expenses. Earlier this year, Lyft and Uber drivers faced new pay cuts, fueling unprecedented protests across California. According to some estimates, compliance with standard labor practices for full-time employees, such as paying for health-care benefits, could pose a 20 to 30 percent of cost increase for gig-economy companies, which currently are not accounted for in their business models. Requiring compliance would radically reshape and negatively impact gig-economy companies’ public valuations, and have been acknowledged by the companies as potential existential threats. In filings made to the Securities and Exchange Commission, many gig-economy firms concede that their business models rely on misclassifying their entire on-demand workforce as independent contractors. Upwork, a digital platform for finding contract labor, which filed for an IPO late last year, told the SEC that an adverse worker classification determination could be costly to both the company and its clients, and could unleash lawsuits, unionization, and a requirement for the firm to pay benefits to its network of freelancers. Grubhub, a gig-economy firm that provides food delivery services, told the SEC that classifying its drivers as employees would not only add legal liabilities and other costs, but would also make it “cost prohibitive” to deliver orders in many areas. Square, which owns food-delivery platform Caviar, has made similar disclosures. These companies’ rush to file IPOs coincides with a flood of lawsuits from workers who say they have worked full-time jobs without the benefits afforded to full-time employees. Just last year, the California Supreme Court handed down an unexpected ruling in a case involving the courier service Dynamex that limited the scope of companies’ abilities to classify workers as independent contractors. In the case, Dynamex had reclassified its entire workforce of drivers as independent contractors to avoid paying benefits as a cost-cutting measure. The ruling opened the door to new legal challenges for companies such as Lyft, Uber, and Postmates, among other gig-economy giants. Lyft, in its filing to the SEC, also lists nearly a dozen punitive class-action lawsuits over worker misclassification, including four class-action cases working their way through California state courts. These gig-economy companies, however, are trying to get ahead of potential legal compliance with labor standards as they exist today. “The reason that — up until now — no court in the U.S. has made this determination is based largely on the legal maneuvering of these companies,” Dubal said. Despite the setback in California, gig-economy firms won a major victory in the U.S. Supreme Court last year. In Epic Systems Corp. v. Lewis, the court decided that workers can waive their rights to class-action lawsuits when they sign arbitration agreements, contract stipulations that have become standard for gig-economy workers. Uber, for instance, swiftly cited the ruling in one of its major class-action lawsuits over misclassification of drivers last year. In October, a federal court decertified one of the class-actions brought against Uber, ruling that each of the 240,000 drivers in the suit must submit to arbitration for claims one at a time. “They have hid behind arbitration agreements, used their significant capital to pay lobbyists, and settled cases where they are worried about getting an adverse judgment,” said Dubal. In an apparent attempt to shed legal some liability ahead of its IPO, Uber this month paid $20 million to settle another major worker classification class-action case. Despite their legal maneuvering, however, pressure is mounting. One arena where there has been a response to the precarious conditions faced by gig-economy workers is in state legislatures. Lawmakers in Oregon and Washington state have proposed legislation that codifies a test to determine worker classification that follows the same lines as California’s Dynamex decision. 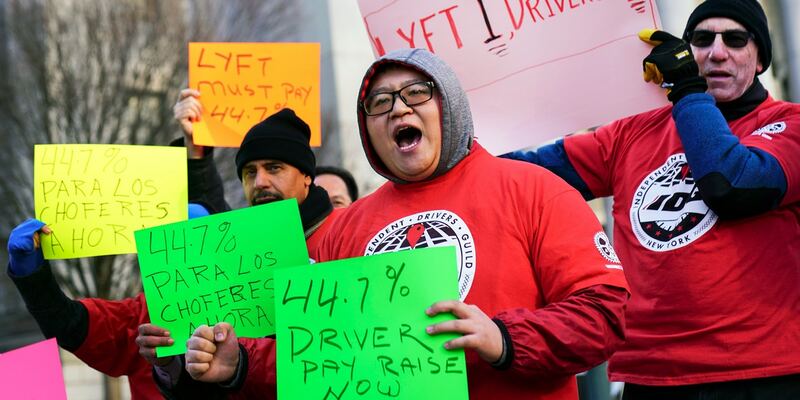 In December, New York City passed the first minimum-wage law for gig-economy drivers. And there is renewed interest in worker classification among resurgent left-leaning national politicians. Democratic presidential contenders Sens. Kirsten Gillibrand, D-N.Y.; Kamala Harris, D-Calif.; Bernie Sanders, I-Vt.; and Elizabeth Warren, D-Mass., have sponsored legislation to narrow the terms under which workers can be classified as independent contractors. Gig-economy companies, however, have worked hard to stay ahead of this legislative curve with an onslaught of aggressive lobbying. In a report released this week and authored by Pinto, the National Employment Law Project detailed how the gig industry financed a coast-to-coast lobbying campaign “to rewrite the rules of worker classification to carve themselves out of labor standards and to codify misclassification.” The National Employment Law Project estimated that Uber and Lyft lobbyists outnumbered lobbyists hired by Amazon, Microsoft, and Walmart combined. In largely Republican-controlled states, gig companies have worked to get laws passed that completely carve their workforce out of consideration for employee classification. In states ruled by Democrats, they have opted for a carrot approach, offering legislation that shifts 2.5 percent of every business transaction into a general benefits fund for workers in exchange for the carve-out for drivers or delivery people to remain independent contractors. “What is ultimately a better business decision? To try to change the law in a way that you think works for your platform, or to make sure your platform fits into the existing law?” Bradley Tusk, a political strategist guiding Uber and Handy, an online platform for contract labor, told CNNMoney. While armies of gig-economy lobbyists have delayed action on worker classification, the future remains unclear. Amid this uncertainty, early investors will have a chance to reap a massive windfall when these companies file their IPOs. On Friday, Lyft was finally listed as a public company, instantly enriching a small set of early investors. Once other gig firms are also listed on the stock markets, however, the public market will be left to deal with the legal uncertainty of worker classification. Public investors will have to address the aftermath of any decision on how to classify workers, while early private investors will have already reaped their rewards from the IPOs. “To be moving forward without clarity on the issue of the status of drivers is incredibly irresponsible,” said Dubal, the law professor. The IPOs stand to enrich the early investors, such as venture capitalists, by transferring risk to retail investors. Pressure to produce profits could also translate into more wage cuts for workers. Stop Using Unroll.me, Right Now. It Sold Your Data to Uber.